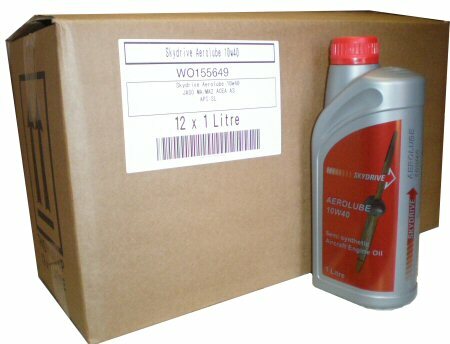 Box of Skydrive Aerolube 10W40 - a four stroke premium semi synthetic Aircraft Engine Oil. specially developed to meet the exacting demands of the latest JASO MA2 specification. Superb performance levels with outstanding protection to all components. Optimum performance under the most arduous of conditions. Suitable for use in engines operated with unleaded fuel or Avgas 100LL. Rapid cold start circulation, providing excellent protection during initial start up. Outstanding gear protection for engines fitted with integral reduction gearboxes. Aerolube 10W40 has been tested to meet the rigorous requirements of Rotax, and is suitable for all versions of Rotax 912 and 914 series aircraft engines.